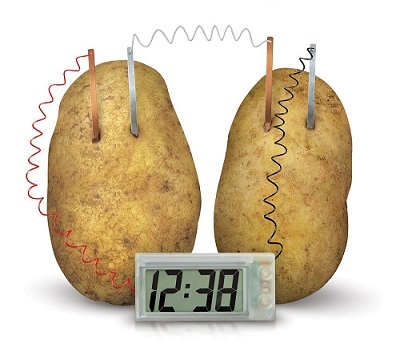 A potato clock runs by converting chemical energy into electrical energy, which is then used to power a clock. The potatoes, in combination with zinc and copper strips (which act as electrodes), act as a battery. Most people aren't aware that this is possible, which is what makes it so interesting. The energy comes from the chemical change in the zinc when it dissolves inside the mild phosphoric acid content of the potato. The energy does not come from the potato itself. What happens is that the zinc is oxidized inside the potato, exchanging some of its electrons with the potato acid in order to reach a lower energy state, and the energy released provides the electrical power. 1) The zinc atoms in contact with the potato dissolve in the presence of the acid. This causes some electrons to separate from the zinc atoms. As a result of this, positively charged zinc ions, and negatively charged electrons, are produced. 2) The electrons produced in the above reaction travel out through the zinc, through the wire, and into the copper strip also inserted in the potato. They do this because they are attracted to the positive hydrogen ions in the potato, located on the copper side (these hydrogen ions are there due to the acid content of the potato). Since the electrons cannot pass through the potato itself, they pass through the wire joining the zinc and copper strips. These electrons then combine with these positive hydrogen ions (on the copper side) and produce hydrogen gas, which then bubbles away. Note that the above chemical reaction happens spontaneously. It is self-driven. The electrons are forced to travel an external path, and if this external path is connected to an electrical device, such as a clock, it powers the device. Two potatoes can be connected together in order to double the voltage, the same way you join two batteries together to double the voltage. This voltage is sufficient to power the potato clock.